P could stand for many Hawaiian cultural symbols and themes: pineapples, paradise, and a fiery goddess who will be part of my V post. They are all compelling and powerful icons of Hawaii, but I’m going to focus on P for Pearl Harbor. The historical attack on December 7th, 1941 by Japanese fighter planes on American ships stationed on Oahu is well-known, as "a date which will live in infamy." It is the event that launched America into World War II. 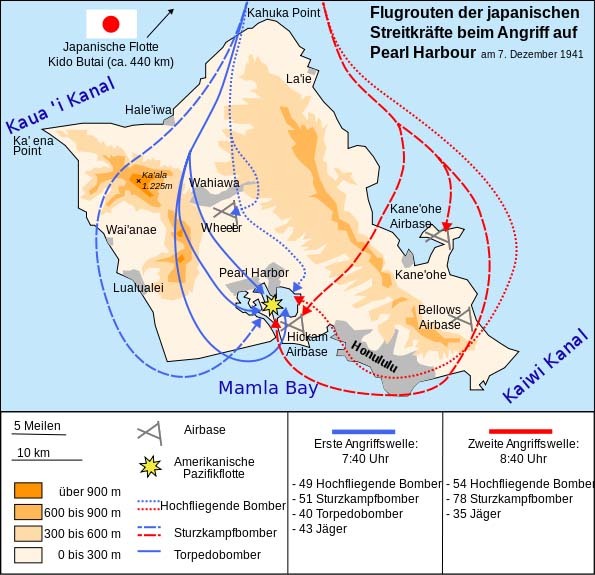 Having grown up on Oahu near Wheeler Air Force Base, one of the military bases attacked on the way to Pearl Harbor, the event was not just a dry textbook event, but a real place in my childhood. USS Arizona Memorial at Pearl Harbor, Oahu. Photo by By Victor-ny (Own work) [CC BY-SA 3.0 (http://creativecommons.org/licenses/by-sa/3.0) or GFDL (http://www.gnu.org/copyleft/fdl.html)], via Wikimedia Commons. Pearl Harbor is a place of pilgrimage. People come here from all over the world to visit this historical site, commemorate the lives lost, and reunite with other veterans of WWII. School children come here for the requisite field trip. 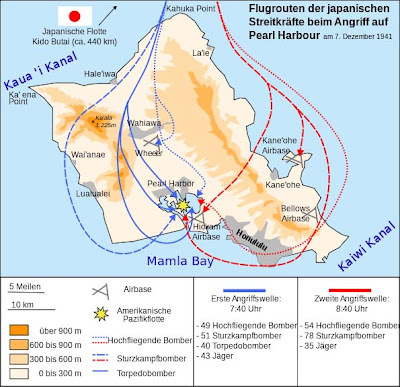 Pearl Harbor is often the main reason why people choose to stay on Oahu as opposed to another island. For those people, Hawaii is synonomous with Pearl Harbor and World War II, underscored by films like “From Here to Eternity.” Another fascinating story set in Hawaii during WWII is Kiana Davenport’s Song of the Exile (which you can also get from the library). Source: Wikipedia Creative Commons by Thomas Steiner. Pearl Harbor is connected with my first and only experience of racism in Hawaii. My family had just moved to Hawaii and I was getting used to a new school. In the cafeteria, the 8-year-old boy in front turned around and accosted me, “My grandpa hates Japs. Your family bombed Pearl Harbor. Your family caused the war.” My mouth dropped open. Gasping for words, I stammered, “But I’m not Japanese!” No amount of protest could change his mind. Telling him that I was an adopted Korean and that my mother had served in the US military did not change his position. He had grown up in the shadow of Pearl Harbor and had learned to hate Japanese people. Ironically, he could have even been part Japanese, since many locals have a mixed ethnic heritage. Surprisingly, even in Hawaii, there was anti-Japanese sentiment during the war, despite Hawaii’s large Japanese population from the sugar cane and pineapple plantations which imported foreign workers. On the mainland, the continental US, the story of the Japanese internment camps is becoming well-documented. But even in Hawaii, there were Japanese internment camps! The story is not that well known, since survivors rarely want to talk about it. One filmmaker has been documenting the story of Hawaii’s Japanese internment camps, The Untold Story, and while I haven’t had a chance to see it yet, am very intrigued. Thankfully, there is relatively little racism or xenophobia in the islands. I can think of examples where it does exist in surprising ways, but am not going to delve deeply into that here. Mostly, there is a lot of tolerance for different cultures and ethnicities. There's a bumper sticker I often see, "No hate in the 808." 808 is the area code for all of Hawaii. Just discovered another A to Z blogger who shared her family's story on December 7th and December 8th, 1941. Aloha and mahalo for reading! If you are commenting from the A to Z challenge, please include a link. I'm doing my best to keep up with commenting, but do sometimes get behind. Mahalo for understanding! Great choice for the letter P.
Another informative and thought-provoking post! On a more serious note, I'm really glad to hear about the "no hate in the 808" motto. It should be that way everywhere! The attack on Pearl Harbor was a dramatic, earth-shattering event in world history that changed everything. I'm very sorry to hear about the unfortunate event in the cafeteria. It sounds like overall people are getting along now. No hate in the 808. A strong historical event. A great post. Hawaii is a place I would love to visit and I hope I can one day. You have a new follower from the A to Z challenge! Pearl Harbour is a place that will go down in history. There was a lot of anti-japanese sentiment here after the war as well, but thankfully it is fading. Mahalo Rebecca...I'm just now finding your blog, http://rebeccabradleycrime.com. Cool! Yes, would love for you to come to Hawaii (and for anyone who wants to...) Plus I'd like to do more travel within Hawaii and outside of Hawaii too. Mahalo Arlee, for commenting and for hosting! Courtney, thanks for linking my post to yours. That's an honor. I had no idea there was a strong anti-Japanese sentiment during WWII in Hawaii. I'm curious about the internment camps. On the mainland, they were placed in very desolate parts of the country. War is such a horrible thing. I'm so glad that I have not had to experience it first hand.